Remember my chestnut-flour-baking-frenzy? After removing the cake from the oven and placing it on a wire rack to cool, I immediately started making these brownies: the recipe called for chopped roasted chestnuts to be incorporated in the batter, but I decided to bake the brownies without them anyway. The result was a cakey brownie, very moist and delicious; I gladly gobbled up two pieces of it and that says a lot since I’m a definitely a fudgy-brownie-kind-of-gal. Preheat the oven to 180°C/350°F. Lightly butter a 23cm (9in) square pan, line it with foil leaving an overhang in two opposite sides. Butter the foil. In a medium bowl, whisk together the all purpose flour, chestnut flour, cocoa, baking soda and salt. Set aside. Melt the chocolate and butter together in a heatproof large bowl over a saucepan of simmering water, stirring until melted and smooth. Remove from the heat. Add the sugars and whisk until smooth. Whisk in the eggs, one at a time, followed by the vanilla and Amaretto (or cognac). Stir in the dry ingredients, mixing until smooth. Pour the batter into the prepared pan and smooth the top. Bake for about 20 minutes or until a toothpick inserted in the center of the brownie comes out clean. Cool completely in the pan over a wire rack. Dust with icing sugar (if desired) and cut into squares to serve. 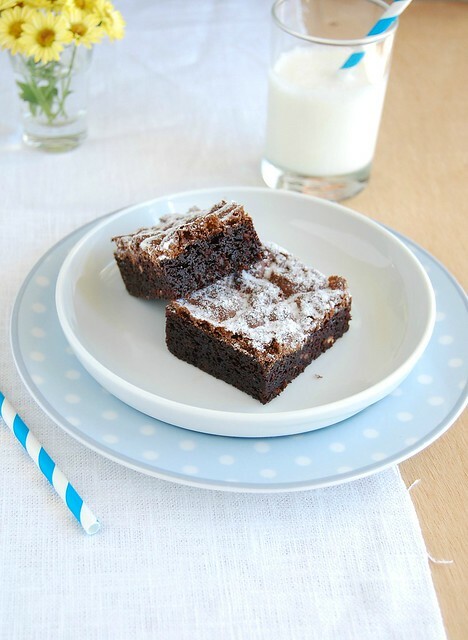 These brownie bars look so moist, almost fudgy, and tempting! i love the sound of amaretto and chestnut flour in these..they look amazeful.. I have not heard of chestnut flour before, this it`s definitely intriguing!